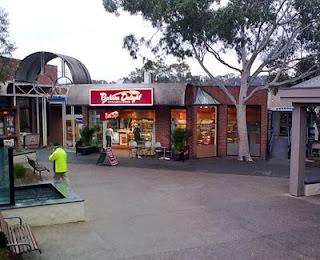 .......53 Buddhas and Me .................My Life Adventures.....: "Eltham Town"
I have lived in the Eltham area for about 19 years now. I moved here because I loved the quiet country, arty, greeny feeling of the area. But oh my, how things have changed. I know with population growth there has to also be growth in the infrastructure, but come on does a small township like Eltham really need three big supermarkets. The traffic is chaotic - there are so many short tempered drivers. The other morning I needed to go to the shops so I decided I would go early to miss all the work, school and general traffic - like at 7.30am. 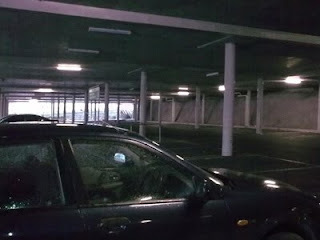 It was so nice when I got to the carpark and it was empty, even the little town square was pretty much deserted other than the council dude doing some sweeping. I did my little bit of shopping in peace and headed back home. 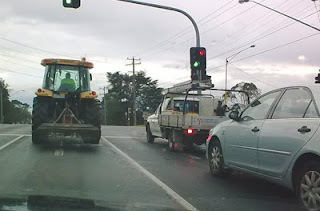 Didn't take long for reality to hit home when I was once again in the traffic - even had a tractor in front me. Oh how I would like to move to a little country town!!! hippy, great post and really an interesting blog.. The song comes to mind "Paved paradise and put up a parking lot." I know exactly what you mean, this is why I am working on getting out of the hustle and bustle of the city life. Three, maybe four more years and I'm outta city life... hopefully for good! I'd rather the chickens, turkeys, donkeys, rabbits, etc. any day of the week then traffic jams, rude drivers and going so fast that my head spins at times when I lie down to go to sleep! I hope for your sanity that you do find the peace and the heavenly bliss you are in search of, a nice spot in the country!